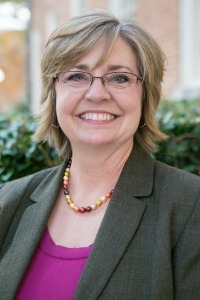 Dr. Kristie Chandler is chair and professor of the department of human development and family life education at Samford. Before becoming a full-time faculty member, she served 15 years in student affairs at Mississippi State University, Texas Christian University, University of Alabama at Birmingham, and Samford. She teaches Marriage and the Family, Family Law and Public Policy, and Child Development Education. Her research interests include experiential education in the college classroom and family policy promotion. Chandler, K., Ford, C., Bateman, M., & Duncan, R. (2014). Assessment of Attitudes of Interior Design Educators toward Concepts, Principles and Theories of Sustainable Design. The International Journal of Design Education, 7 (3), 11-25. Chandler, K. (2011). Hind sight is 20/20: A case study of vision and reading issues sheds light for teacher education programs. Education. Chandler, K., Gerhardt, C., Dearing, A., & Tanner, G. A. (2012). The Educator's Perspective on Family Advocacy (CFLE Network). NCFR publication, 292 (24(3)), 12-13. Chandler, K. (2012). CFLE Perspectives: The Educator's Perspective on Family Advocacy. (CFLE Network). NCFR publication. Chandler, K. (2010). Potter, profit and profession. National Council on Family Relations Report, FF (45), F11. Chandler, K. & Kalinich, S. (April 2014). HDFE 400 Goes to Washington. SECFR Family Policy Symposium, Birmingham, AL. Gerhardt, C. & Chandler, K. (April 2014). The safety net of public policy: A study of civic engagement. SECFR Family Policy Symposium, Birmingham, AL. Gerhardt, C.E. & Chandler, K.C. (February 20, 2014). Risk and Resilience: A Study of Civic Engagement. Alabama Association for Family and Consumer Science 2014 Annual Conference, Tuscaloosa, AL. Chandler, K. (2014, November). From Classroom to Conference: Promoting Professionalism. National Conference on Family Relations Annual Conference 2014, Baltimore, Maryland. Chandler, K., Gerhardt, C., & Davis, J. (2012, March). Scaffolding Toward Scholarship. SECFR Conference 2012 Chattanooga, TN.